The Male Orphan Asylum sat on rocky, ungraded ground where today Cartier Jewelers and the Olympic Towers stand. -- sketch from the Archdioces of New York Archives. When the immense Croton Reservoir was opened in June 1842 on Fifth Avenue at 42nd Street it stood atop Murray Hill well north of the developed city. Fifth Avenue was graded and improved up to this point, allowing carriages of well-dressed citizens to travel back and forth for Sunday promenades on the reservoir's broad rim. The same year that the Croton Reservoir was opened, a little frame church—the Church of St. John the Evangelist—was erected on the northeast corner of Fifth Avenue and 50th Street. Later the magnificent white marble St.Patrick’s Cathedral would take its place. But for now the area was bucolic and sparsely populated. Nearly thirty years earlier, in 1817, the Roman Catholic Benevolent Society was organized. Run by the Sisters of Charity, it guaranteed that Catholic foundlings and orphans would not be lost to the faith by being taken in by a Protestant organization. The first building, at Prince and Mulberry Streets, had accommodations for 30 “inmates.” The influx of children was such that a new building was quickly acquired on Prince Street, which then had to be enlarged. Finally, in 1845, Archbishop John Hughes approached the city for a more permanent solution. The rural and rolling meadows around St. John the Evangelist offered fresh air and hilltop breezes. That, coupled with the location’s remoteness and low property value, created the perfect spot for an orphanage. The city gave Hughes a lease on the block of land from Fifth to Madison Avenue, between 51st and 52nd Streets. The agreement, dated August 1, 1846, stipulated that the land would be used only to shelter orphans, and rent would be one dollar per year. 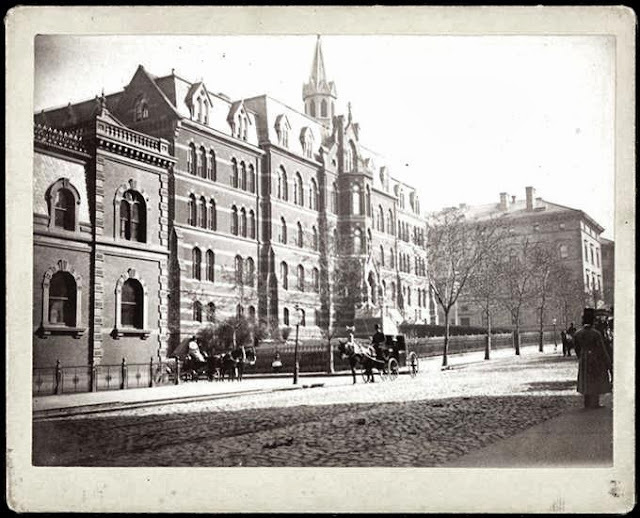 Based on its similarities to buildings he designed on Blackwell’s Island—like the Gothic-style Small-Pox Hospital—it is highly possible that the Roman Catholic Orphan Asylum (originally called the Male Orphan Asylum) was designed by James Renwick, Jr. When it opened in 1851 the facility had accommodations for 500 boys. The boys-only institution would quickly see the neighborhood start to change. A year later Archbishop Hughes acquired most of the block directly to the south of the orphanage and in 1853 bought the corner belonging to the Church of St. John the Evangelist. The gears were now engaged; grinding into motion the archbishop’s monumental dream of erecting the most lavish and costly church in the city—St. Patrick’s Cathedral—designed by Renwick. While Hughes’s dramatic cathedral rose, the boys next door received instruction in all the areas of education that the public schools covered. But the Asylum educated its boys within a military structure. The orphans were taught military drills, officers were promoted among them, and rigid military discipline was expected. The Roman Catholic Orphan Asylum depended mostly on private donations to operate. In order to prove to its benefactors that their money was well-spent, the facility hosted an “Annual Exhibition” during which the boys’ education and progress were proudly put on display. On June 24, 1859 the exhibition, deemed by The New York Times to be “a pleasant entertainment,” was presented to a host of wealthy citizens, politicians and clergy. The Times said “The boys, to the number of some five hundred—clean, smart, sharp, lively lads, all—went through their annual exhibition in presence of a large and distinguished audience.” The boys performed their lessons in the large auditorium in front of some of New York’s wealthiest and most influential citizens. The boys closed the display with a “scene from the Revolution.” The orphans dressed in Continental Army costumes and acted out a little drama. “The rear of the troop was brought up by four little urchins—none of them over three years of age—who toddled along in a most uncertain manner, and whose movements excited more attention, and occasioned more laughter, than any other event of the day,” reported The Times. In 1865 the Asylum received a large endowment in the will of Peter Boland for the establishment and maintenance of a farm/industrial school. The Boland Farm was established near Peekskill under the operation of the Brothers of the Christian Schools where the orphaned boys learned trades that would enable them to survive in the world once they left. In 1875 wealthy families came together to support the Asylum when two performances were staged at the Academy of Music for its benefit. The entertainments were “largely attended” and around $6,000 was collected—around $115,000 in today’s dollars. Renwick & Sands was commissioned to design a Girls Asylum on the eastern end of the block, fronting Madison Avenue, which was opened in 1886. Between the two hulking buildings was the grassy lot and drill field. 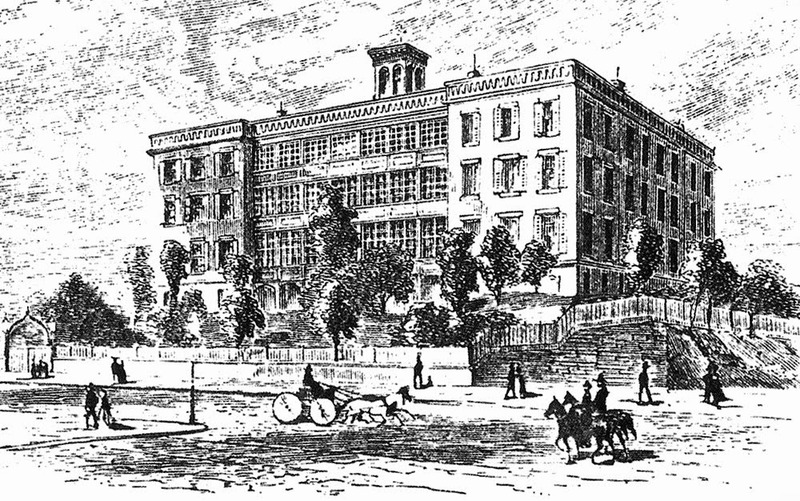 The Catholic World noted that “The asylum now includes the Male Orphan Asylum on Fifth Avenue, the Female Orphan Asylum on Madison Avenue, and the Boland Farm…Half-orphans as well as orphans are received in all three institutions.” At the time there were a total of 964 inmates, “273 orphans and 691 half-orphans” being cared for. In 1889 $45,000 was spent in renovating the aging boys’ asylum. The expensive repairs did not include vermin extermination, apparently, and on February 12, 1890 a rat busied itself “building a nest between the beams of the attic flooring and using matches in its construction,” according to Fire Department experts. The result was a fire that broke out in the attic around 8:00 in the morning. The military training of the boys proved valuable. “In a few seconds nuns, servants, and children, thanks to instruction in fire drill and the drill of the cadet corps of 200 of the boys by gallant little “Colonel” Robert Johnson were doing precisely what they should do with the coolness and precision of automatons,” reported The New York Times. The boys pushed beds and lugged bedding out of the building; while others helped the nuns in the chapel “completely dismantle the altar and carry all that could be moved from it to the rear of the parlor in the centre of the building." The neighborhood was now lined with opulent mansions and concerned socialites rushed to the scene. The wealthy women “remained and helped the nuns until studies were resumed in the classrooms.” Fire damage amounted to between $8,000 to $9,000 to the building and $3,000 to $4,000 in property. 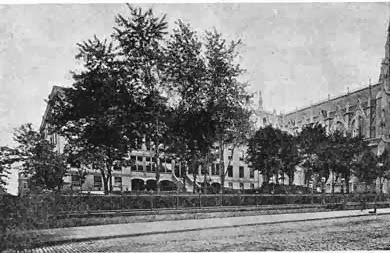 The complex would be enlarged once again when on October 2, 1892 the cornerstone was laid for the Boland Trade School, an extension of the boys’ orphanage, on the opposite side of Madison Avenue. “In the laying of this cornerstone the Board of Managers of the orphan asylum see the solution of a problem which has long perplexed them. That problem has been what to do with boys when it was time to send them out into the world to earn their own livings,” said The Times. When the Constitutional Convention’s Sub-Committee on Charities and Education visited the orphanage on June 13, 1894 there were 52 Sisters of Charity manning the institutions—26 each at the Girls’ and Boys’ asylums. The women were currently caring for 895 children. In 1896 St. Luke’s Hospital was demolished. Like the orphanage, it took up an entire Fifth Avenue blockfront between 54th and 55th Streets. The now-valuable real estate was quickly snatched up by millionaires and the exclusive University Club, which set McKim, Mead & White to work designing its new clubhouse on the site. The potentially-lucrative real estate under the Roman Catholic Orphan Asylum did not go unnoticed as well. In January 1899 the trustees of the Orphan Asylum took title to property in Fordham Heights as the site of a new facility. The news perked the attention of millionaires and developers alike. But another incident at the orphanage grounds also caused a stir. On March 29 that year a steer broke loose from one of the cattle transport boats docked at the piers around East 42nd Street. The reddish-brown bull (“not any particular breed—just plain steer,” said The Times) ended up in the enclosed grounds between the Girls’ and Boys’ Asylums. It resulted in an impromptu rodeo made up of policemen and “venturesome civilians” who tried to subdue the beast. The tragedy, at least for the bull, was the penalty of death for his escape from the cattle boat. Although he, at first, was slated to become beef steaks for the orphans, police headquarters had the carcass held for its rightful claimant. Finally as the 19th century turned into the 20th, the building plots were sold off. The Vanderbilt family purchased the Fifth Avenue frontage, thereby ensuring their homes on the opposite side of the street would not be sullied by commercial structures. 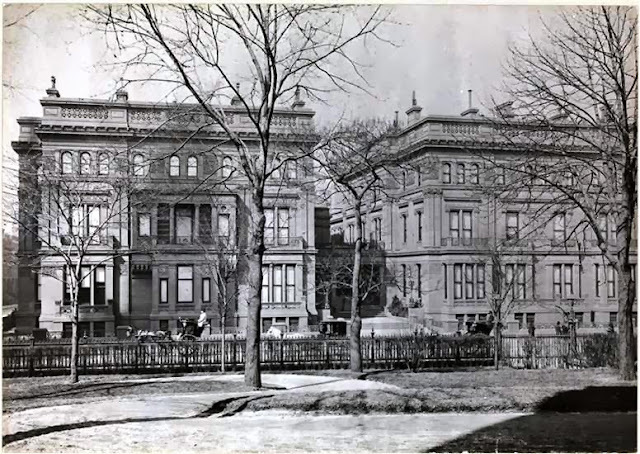 Before long the elegant Morton Plant mansion would occupy the northern corner, the exclusive Union Club would rise on the southern end, and between them George W. Vanderbilt constructed two lavish white marble twin mansions. Today only the northern portion of the block survives from that early phase of construction. The Morton Plant mansion houses Cartier jewelers and one of Vanderbilt’s marble twins remains as Versace’s flagship store. Thank you for this! I believe that my great-great-grandfather was among the boys performing at the 1859 exhibition. The census says he was living there in 1860 and indicate that he arrived there in 1856.